The next major entry in one of the most beloved video game series of all time was due to arrive in September of this year after a long gestation period. However, Final Fantasy XV has now been delayed until November 29, 2016. While I, like most people, find this news to be a bit disappointing, I would also rather see this major entry be in its most complete form when it sees the light of day. So I err on the positive side of the delay reaction, more than the negative side. I will be reviewing the game for Operation Rainfall when it does arrive later this year (I’m going to assume for now that it will not see another delay). 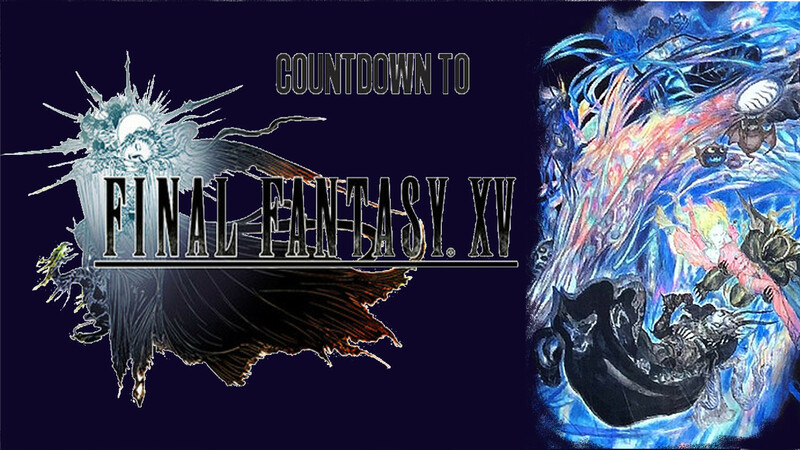 In the meantime, I will be posting my top list of Final Fantasy games as a countdown until the release of the next entry. I can almost guarantee that our lists will be different, and I encourage discussion. This will also let our readers know some of the history of this franchise, and my own personal thoughts on it. This ranking is my own opinion and does not represent the views of the rest of the Operation Rainfall staff, but it is a creation that I am proud of, so I stand behind it. These rules are rather arbitrary, but I had to decide on a list of them just to make it more concise and clear. The first rule is that I will only put one version, the best version I’ve played, of each game. And the second rule, and possibly most contentious, is that I am listing any game that contains Final Fantasy in the American title of the game. That does mean a couple games featuring Final Fantasy characters, but not having that title, will not make the list. 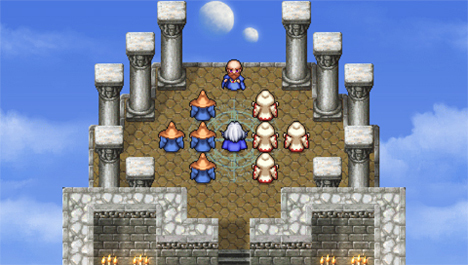 Examples of games featuring characters would be Chocobo’s Mysterious Dungeon or Ehrgeiz: God Bless The Ring. And that also means that there are other titles which were not originally Final Fantasy games in here as well, such as Final Fantasy Legend. Other than that, this list is just to have some fun and have a conversation while we wait for the next release in this classic JRPG franchise. There are 34 entries on my personal list, even discounting the different versions, so plan on a long series of articles, and I hope that you enjoy them. It’s easy to forget these days, but it was for good reason that this game was named Final Fantasy II for it’s US release. 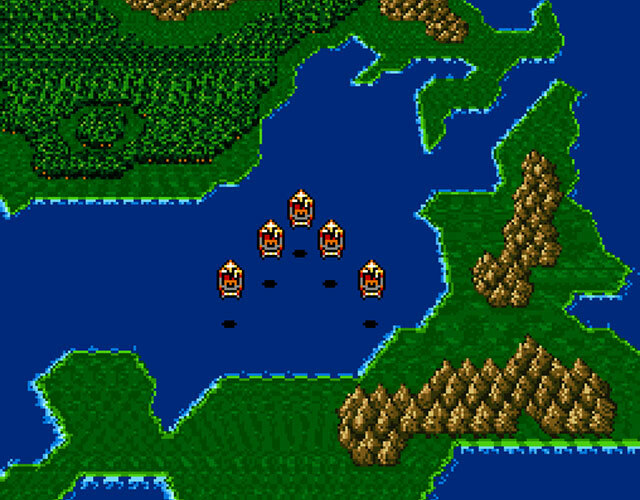 We had missed the original Final Fantasy II and Final Fantasy III releases on NES, and didn’t get a chance to play them (officially) until many years later. That meant that there were quite a few years between the release of Final Fantasy on NES and the next time we were able to play a new Final Fantasy here in the States. While the wait was definitely frustrating, the upgrade between titles was massive once we got our hands on Final Fantasy IV. And nothing made my new SNES feel like a wonderful new machine more than this game. Don’t get me wrong, I love many of the early SNES games, especially Super Mario World, but this game is my favorite of the early lineup. While the selection of this game so high on my list shouldn’t surprise many people, which version of the game I choose might. I actually do not like the new 3D remastering of the game, it removes way too much of the charm from the original. So my favorite version of this game is either the Final Fantasy IV: Complete Collection on the PlayStation Portable (also playable on the PS Vita), or the Final Fantasy IV port to the GameBoy Advance. I’m not too fond of Final Fantasy IV: The After Years, and I don’t consider it a separate game for the purpose of this list, but the extra dungeon and boss loot makes enough of an improvement to suggest either of those versions over the original SNES. 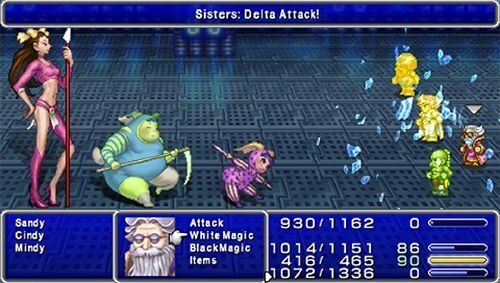 The PlayStation 1 release of Final Fantasy IV did not have as many technical issues as the port of Final Fantasy V, but it’s still not as good as on PSP or GBA or the SNES original. But the iOS version of the game, I almost feel like I wasted my money on that one, even for a game that I hold so dearly to my heart. Unless your first game in this series was Final Fantasy VII, more than likely the characters from Final Fantasy IV are some of the most beloved characters in this entire series. Most of the cast in this game had fairly simple personalities and motivations, but they still definitely had their own stories. And that was a very new thing for console RPGs when this game came out. In fact, I was also playing PC RPGs at the time and I would say that this story was much more fleshed out and melodramatic than anything I had played on PC. Characters disappear or die frequently in the game, sometimes they will come back and sometimes they won’t. The primary conflict between family members has drawn a lot of comparisons with Star Wars over the years, but some of that is a bit overblown. Most of the comparisons are due to the similarity between their versions of the classic Hero’s Journey, but that is a very classic story motif. 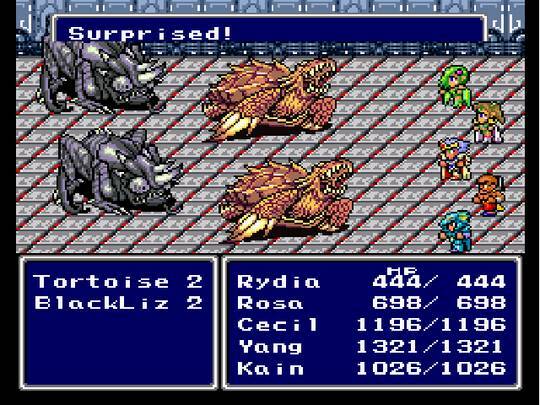 Either way, characters like Cecil, Kain, Rydia, Rosa, Tella, and so on, will remain some of the most beloved RPG characters of all time. Looking back on the huge cast of characters (less than half of which I have named so far) it may seem like any specific character may get lost in that cast. But the characters were so memorable that I can still name the full cast off the top of my head and tell you pretty much anything you want to know about them. It remains a great example of what you can do with a little extra console power. The graphic upgrades were nice compared to the NES games, but this will never be considered a giant leap forward in that department, nor does it compare well in graphics to other early SNES games. But what they did with the game was made its world far more advanced, it’s story far longer and more detailed, and it’s music beautiful. You can say what you want about the conflict between the Mode 7 style graphics of the SNES and the Blast Processing of the SEGA Genesis, but there is zero doubt which console featured the far superior sound card. That extra story was my largest surprise about this game and remains one of my fondest gaming memories of all time. I got to (what I thought was) the ending of the game, only to find that I had to go underground instead, and I found a whole new set of dark crystals. Then, when I was certain that the game was wrapping up all over again, here I was traveling to the moon and to an all new overworld and set of dungeons. The game just kept on going and going, and I could not have been happier. Initially, I had to rent this game from Blockbuster because it came out during the school year and I didn’t have the money to purchase it outright. So this game still owns my personal record for my longest rental. And even after beating it over a week timeframe, I did not want to return it to the store. So the first thing I purchased when I was next earning a paycheck was this game. It seems strange to say this many years later, but this game is what formed my idea of what a “modern” RPG should be. As much as I loved the NES original, this game really established what a JRPG should be, heavy on the story and the character development but with still fun character building and combat. From the cinematic opening on, the story wowed me. But the combat system ended up really staying with me as well. To this day I still have a deep love for party turned based combat. My number one game on this list does have my favorite example of RPG combat, but this is my number two (and they are rather similar in combat style, hint, hint). This also represented my first time going out of my way to grind up super-powerful god characters to absolutely destroy everything in the game. After this title, I was completely ruined for any RPG that would not allow me to do that. I still remember figuring out that I could equip frost weapons on Cecil and Kain, cast float on my party, and then just destroy all the Arachne that a Summoner could call up. I could spend an hour or two in combat, kill all but one character, and then finish off the summoner to get a full Level 99 character in one go. It felt like I was breaking the game, but the game was allowing me to do so and I loved it. 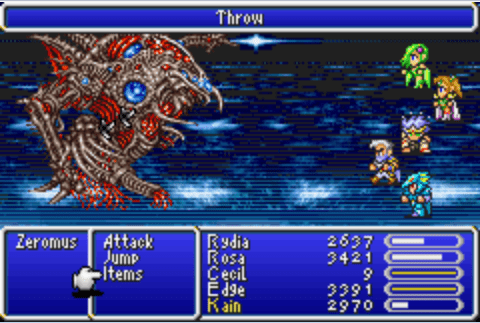 The wonderful optional bosses for the ultimate weapons in the Crystal Palace made it worth that grinding effort, though, so the game definitely rewarded you for trying to break it. So this game ended up combining great combat, with memorable characters, amazing music, and a wonderful story. Really I cannot say enough good about this game. Even talking about it makes me want to start up my PS Vita to play it again. I do wish that Square Enix would release that amazing GameBoy Advance port on a newer system, just like with Final Fantasy V, but there are more good versions of this game than there are with that one. 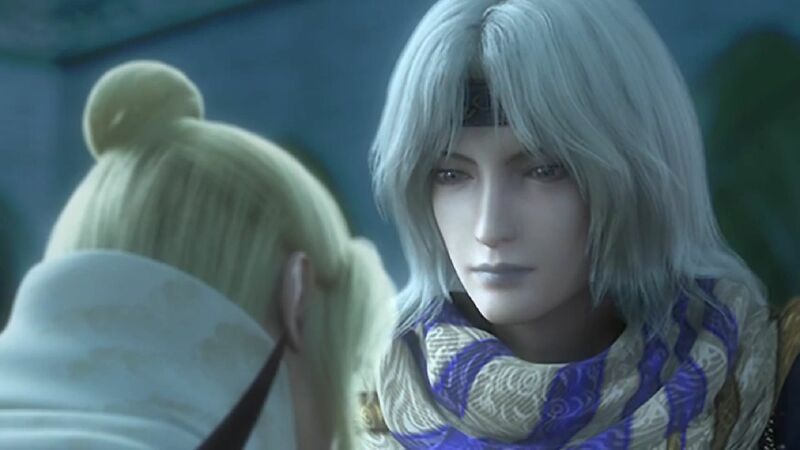 I still remember the powerful emotions that the ending of this game wrought within me, and I hope that the modern Final Fantasy fans will eventually all go back and play this masterpiece. This is a long way off of what the modern version of this series has become, but in getting so far away from this design, much has been lost in the process. Especially in the charm department.